Rise is the newest venture by Durham Catering Co. chef and owner Tom Ferguson, who you may know for that little food truck and brick and mortar store called Only Burger of which he is a part-owner. Only Burger has earned a lot of cred in the local food scene for being an essential player in the explosion of food trucks, often organizing the earliest food truck rodeos in addition to maintaining a fantastic hamburger shop and truck. The community has been paying Tom back by swamping Rise to get their hands on the handmade biscuits and cake donuts available at the shop. The creative configurations of both, think red velvet donuts and sloppy joe biscuits, change on a daily basis. You can usually find a list at their Facebook page. They also have donut seeds instead of donut holes—don’t ask me what the difference is. 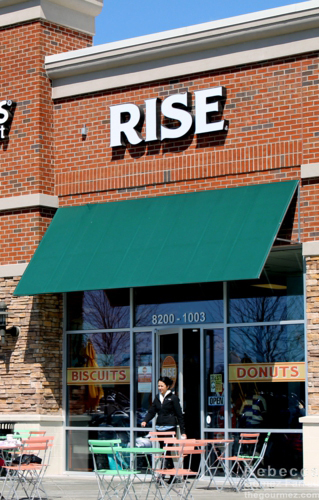 I’d heard several tales of long lines at Rise, so I went with a pair of friends on a weekday rather than brave the weekend crowds. There’s not much seating, just a long counter on the side and a few patio tables, so food is taken to go. Counter seating on the left. Grab a number on the way in and expect a ten-minute or so wait after ordering food. 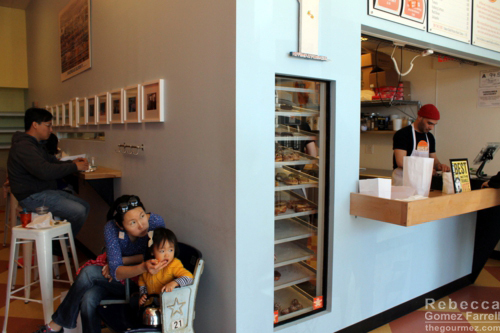 The interior is kid friendly with chalkboards and an assortment of toys. 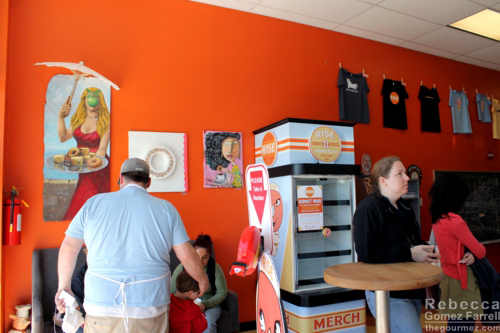 Whimsical artwork, a line of t-shirts, and bright orange walls keep the atmosphere lively. The display case is drool worthy all on its own and will keep you happy while you wait. Pineapple-basil glaze donuts on the top. 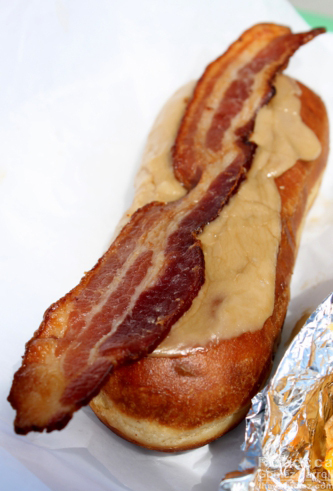 Maple bacon on the bottom. Bean Traders coffee is offered, which makes me happy as I’m a huge Bean Traders fan. Milk, OJ, tea, and water are also available. 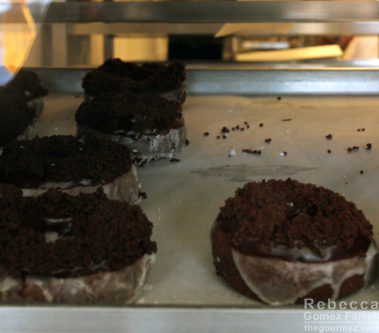 My friends and I all tried a biscuit treat and a donut, because that makes life more fun. Or maybe we don’t know how to say no to anything we haven’t tried before—you decide. Biscuits are $1 to start, and there is a range of add-ons you can get for them including eggs, meat, honey, et cetera, for $0.25 to $4.00 depending on what you want. If you want more than a couple toppings, take a look at the specials menu because you might get more for your money. 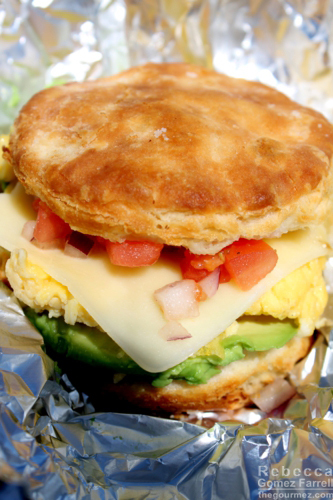 I opted for the huevos rancheros biscuit sandwich that came with a fried egg (I substituted scrambled), tomato salsa, white cheddar, salsa, avocado, and black bean dip (I asked them to leave that off) for $4.50. It was a great lunch sandwich for me, the perfect size to fill me up without leaving me wanting more. The biscuits were outstanding: golden-brown, flaky, and with a satisfying crust. The salsa had an excellent melding of tomato, onion, and cilantro flavors. The cheddar really stood out, though I prefer my cheese more melted. No picture, but I have reports from Friend #1 that the roasted butternut squash biscuit with arugula and roasted pepper relish was very delicious and packed with veggies. The pig in a blanket looked quite scrumptious as well. 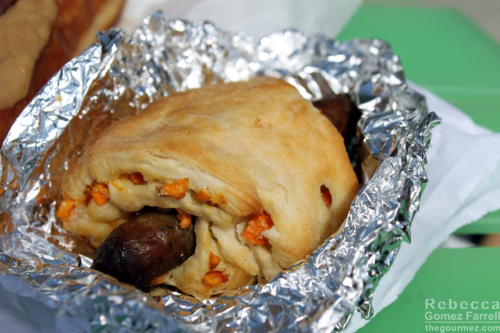 It was a Farmhand Foods sausage link rolled up in biscuit dough along with sweet potato chunks and cheddar and was reportedly delicious. The chicken biscuit was also a unanimous hit at Friend #1’s workplace later that week. 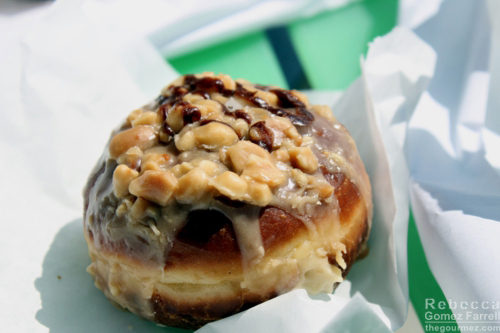 –was pretty tasty according to Friend #1’s husband, but the filling was somewhat sour, which was unexpected. 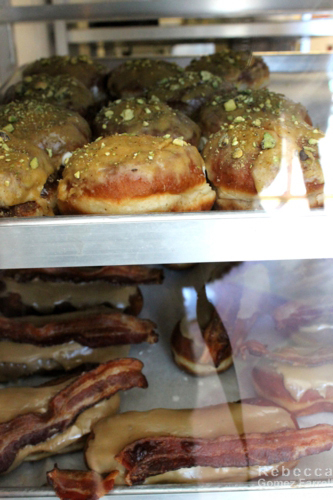 The maple bacon bar was declared yummy and faithful to what most people would consider an old-fashioned donut. Friend #2 thought it was hilarious that the bacon part was just that slab of bacon on top. 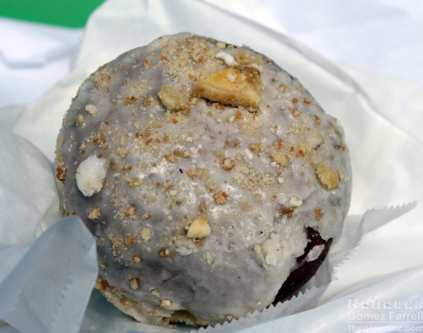 My donut, however, got much higher marks than the rest, in part because I’m not usually a donut fan. It was a banana pudding donut, and I quite loved it, from the banana chips and wafer crumbs in vanilla frosting on top to the delicious banana pudding inside. On first bite I was a bit worried because it tasted strongly of fryer grease, but that creamy pudding dominated the donut and made all my concerns go away. I was thrilled with it. 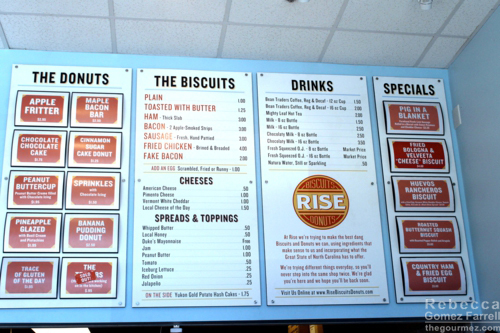 Rise is assuredly a great spot to pick up a biscuit with whatever you’d like on it, and as I’m a sucker for biscuit, egg, and cheese sandwiches, I suspect I’ll be back for plenty of those. 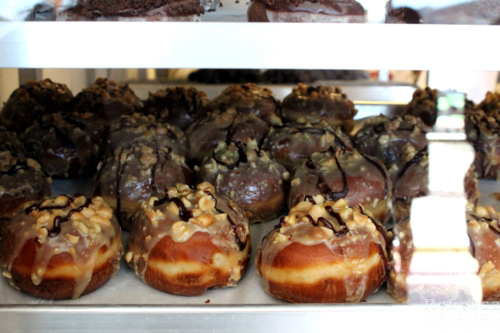 The donuts aren’t perfect, but when the toppings and fillings hit it just right, they are quite delicious. I’m also a sucker for inventiveness, so Rise gets my highest marks even with a few imperfections. It’s worth it, especially the biscuits! Rise is great. The ham biscuit is simple but very nice. It’s very difficult to order just a biscuit though!